I chose a destination wedding because I’ve always dreamed of getting married on the beach in a beautiful tropical atmosphere. My husband is from the Dominican Republic so it just made sense to have it in his native country. 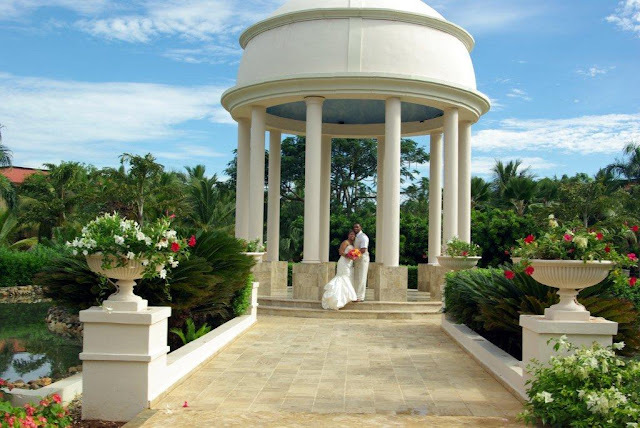 I chose Dreams Resort and Spa in Punta Cana because their wedding packages seemed to give you the most bang for your buck. I do not enjoy being stressed out so having everything put together for me made life a lot easier. What I’ve learned from my experience is to roll with the punches. Unexpected things are going to occur and if you let it bother you, it will interfere with your wonderful experience. Your special day comes and goes so quickly so you have to enjoy every moment. I did not have a lot of people attend my wedding although I invited quite a few. A few friends and family decided to wait to the last minute and the resort sold out so please tell your loved ones to book in advance. I also had friends and family that were unable to go but I didn’t find out till the last minute. This definitely altered my plans and bridal party but I refused to let that interfere with my special day. Keeping a positive attitude is key when having a destination wedding. The service was wonderful at the resort and I know I made the right decision. Bride: We decided to have a destination wedding because of the ease of planning. We are big travelers so it was just like wanting to have a big family vacation. Bride: There are lots of good reviews and feedback from the resort, so that made us feel comfortable choosing it. Bride: The biggest difficulty was figuring out how to get everything over there. We had at least 4 luggages with gifts for the guests, suit, dress, centerpieces, wedding topper, etc. 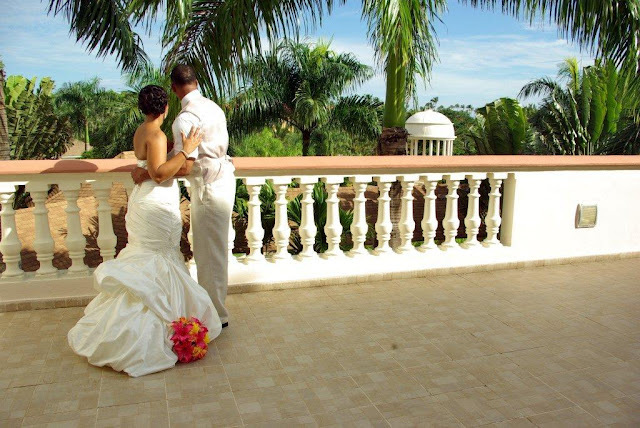 Bride: The highlight of the destination was actually seeing everything put together for the ceremony and reception. It was everything I imagined and more. The biggest surprise was everyone still getting together almost everyday. The resort was not too big or not too small. Bride: It was a breeze to work with the wedding coordinator and the resort . She was great and did everything I asked . Bride: My advise for a friend on planning a destination wedding – pack way in advance. Especially if you’re doing gifts for the guests, centerpieces, etc. Bride: I would only change the room situation. We went from deluxe room to honeymoon suite, husband switched to groomsman room, back to honeymoon suite. It was a lot of re-packing and unpacking . I’ve always wanted to have an intimate destination wedding. With our family and friends residing in different locations, this was the perfect opportunity to bring everyone together. Cost also played an important factor. Economically, there wasn’t a venue in the states that provided a comparable package for the value that we received at Dreams Resort. I viewed many resorts online and fell in love with Dreams Punta Cana. It was breath-takenly beautiful. 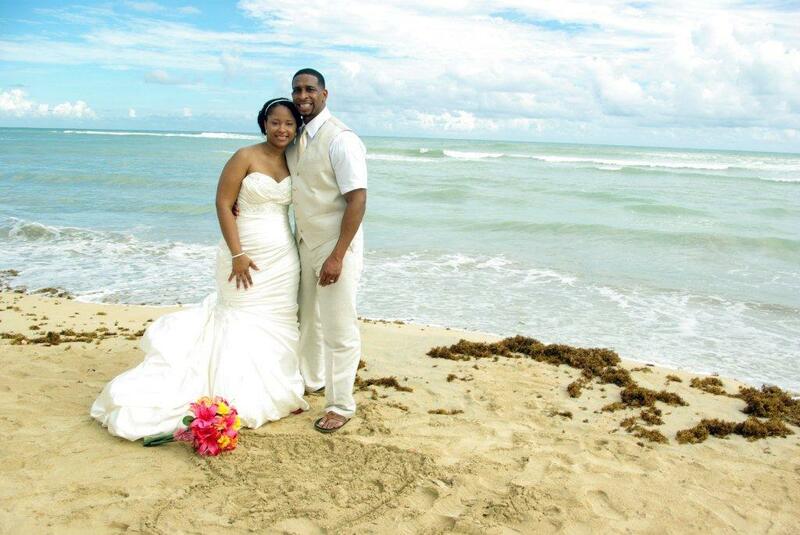 Dreams provided an option of having our wedding on the beach or under their gazebo. The resort also provided multiple terraces with different views for us to choose from to host our reception party. Not only are the wedding packages a steal, but Dreams also provide free anniversary nights, which we will be taking advantage of. The biggest difficulty was not being able to physically interact with the wedding coordinator and/or venue prior to arriving at the resort. Unlike hosting a local wedding, we didn’t have the opportunity to tour the venue and sample a tasting menu (including the wedding cake). We were left blindly trusting the wedding coordinator and the resort and they did not disappoint. 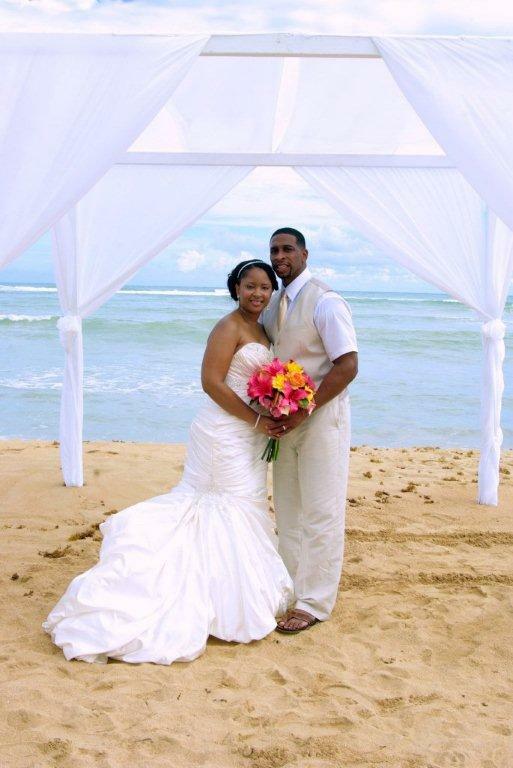 I highly recommend Carolina Guzman as wedding coordinator for any bride getting married at Dreams Punta Cana. The other difficult part to planning the destination wedding was actually traveling with my wedding attire, decorations, and party favors. The resort allows you to bring your own decorations (that they gladly set-up for us). This was a huge cost savings. Unfortunately, the cost to ship large packages to the Dominican Republic is astronomical so we shipped everything aboard the airline carrier with us. As unbelievable as it may sound, it actually cost less to ship our decoration with the rest of our luggage, rather than shipping via USPS, FedEx, or UPS. The highlight of the experience for me was marveling in the spirit of love that filled the air. 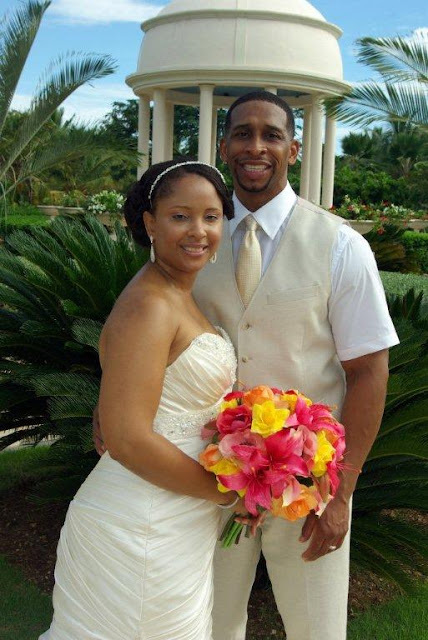 Our wedding provided an opportunity for other couples to rekindle their love affair with each other. A few of our guest actually thanked us for allowing them to share in our special occasion because our wedding provided a second honeymoon for them. Seeing how the wedding came together was a big surprise. The ceremony and reception looked absolutely beautiful, so much so that guests of the resort, who were not apart of our wedding party, asked if they could attend our wedding. To my surprise, my family had planned a “New Orleans Second Line” so we were able to incorporate a lot of our customs/traditions at the wedding. And finally, I will never forget the joy and excitement on my husband’s face as he reveled in our special day. I surprised him by planning an incredible fire show. The amazement on his face was priceless. Both the resort and the wedding coordinator were easy to work with. They allowed is to make our wedding as personal as we liked. They were quick to respond to our needs and extremely accommodating. Carolina Guzman is an excellent coordinator with a great amount of patience. Also, the resort’s salon was phenomenal. The ladies at the salon styled my hair and applied make-up applications for all of the ladies in my wedding party. Stylist Vanessa was extraordinary to work with. My advice is to plan early and consult directly with the wedding coordinator. Plan the wedding of your dreams because you deserve it. I think that the resort should provide a ground level changing/waiting room for the bridal party. Our suite was near the back of the resort on the third floor. I had to rush down three flights of stairs in high heel shoes, carrying the bottom portion of my wedding dress, then walk to the front of the resort to its gazebo. It would have been nice to have been on the first level near the gazebo preparing for the wedding, especially considering that there is a small building with bridal displays in the windows near the salon. I also had to go back to our room to change into my 2nd dress during the reception. Again, a changing room near the wedding would have been helpful and more convenient.